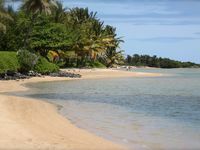 Kepuhi Beach (see more photos, view panorama), located on Molokai's west shore, is a long and wide sandy beach. 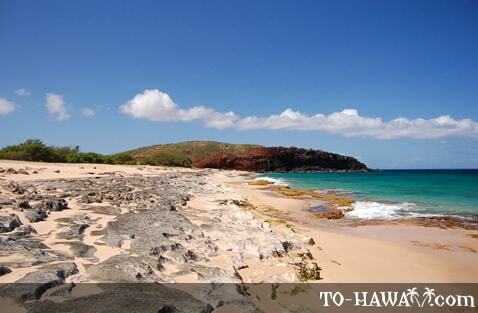 On the southern end of the beach is Kaiaka Rock, which was once the location of a heiau (Hawaiian temple). Even though the beach looks inviting, swimming is only possible here on very calm days because of strong alongshore currents that can be treacherous. In the winter months or when the surf is up, the entire length of the beach gets pounded by high waves with dangerous shorebreaks. This is when powerful rip currents occur. Sometimes the waves are good enough for bodyboarding or surfing, but only for experts. During extended periods of heavy surf, the waves often times erode the beach and flush the sand out to sea, exposing large beach rocks. Kepuhi Beach has two sections, which are devided by a few large lava rocks along the shoreline. The northern part is smaller and doesn't have exposed rocks on the shoreline. The longer southern part has exposed beach rocks. 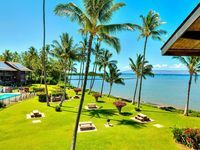 We stayed at Kapuhi Beach Resort which is up from the beach about a city block. We have been to all 50 states, all of Canada and parts of Europe and have never seen anything as beautiful as Kapuhi Neach. That includes all of the Hawsiian Islands. We go back every year. 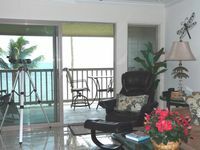 We stayed at the Kaluakoi Villas for a week so we had frequent walks at Kepuhi Beach. The beach is long and there is a trail that leads along the beach. Some parts of the trail are overgrown with bushes and grass (where the golf course used to be). 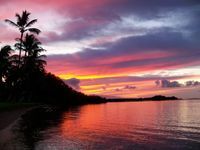 There are a few coconut trees as well, so watch out for falling coconuts because the trees are not maintained in all areas of the beach. The beach itself is very scenic. The colors of the water were amazing - in the morning it was a deep blue and in the afternoon it was a turquoise blue. We loved watching the sunset here too. On a clear day (most of the days were clear while we stayed here) you could see all the way to Oahu.